WattBuddy wins best overall app! WattBuddy won the top prize for best overall app in the Department of Energy's Apps for Energy contest, the second piece of the American Energy Data Challenge. 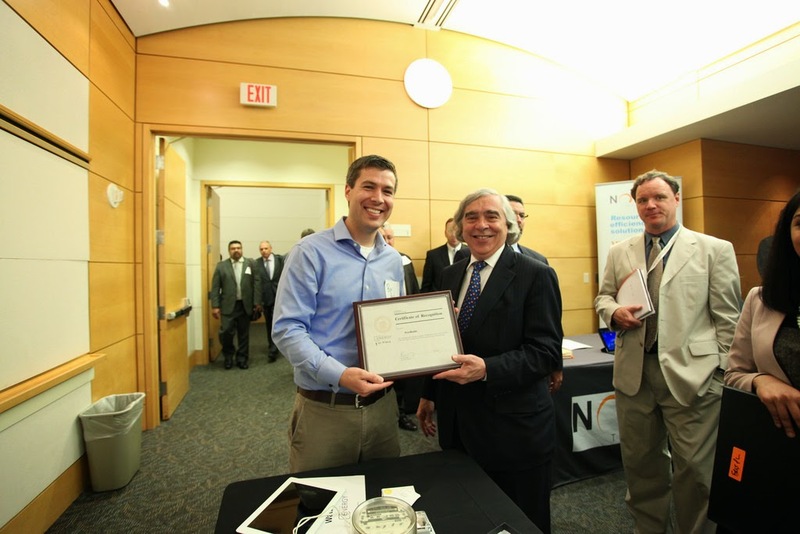 On Wednesday Secretary of Energy Dr. Ernest Moniz announced the winners and presented WattB with a plaque, at an energy Datapalooza sponsored by the White House. WattBuddy and WattZ won huge prizes at the second Department of Energy AppsForEnergy contest April 29th, and could still win another prize at the end of May. WattBuddy won the biggest prize announced to date, the first prize for the GreenButton Data use, and a second prize for best use of the Energy Information Administration API. WattZ took home the prize for best use of the Building Performance Database. Best yet, WattBuddy is a finalist for the best overall prize, which will be announced on 28th May at a Department of Energy event. Tech Cocktail article about WattBuddy and WattZ! I forgot to post this before, but Ronald Barba did a great writeup of WattBuddy and WattZ in Tech Cocktail last month. He talked to me and covered both applications really well in the run up to the Department of Energy contest. I'm super excited that he took the time to dive deep and help us get the word out about saving money and electricity with WattB. WattBuddy also lets you track your energy usage by connecting to your utility company. You can also take a photo of your meter to get a reading. A cool graph lets you see how your energy usage fluctuates. If you're luck, the app will even show you energy deals in your area. The app is free at Apple's App Store. Very excited to have some good press. We made a video for WattZ, the app that estimates your electricity costs for virtually every home in the US. Let us know what you think! We've created a video to let you know how WattBuddy can take charge of your electricity use, with Track, Graph, and Save. Take a look and let us know what you think. Two apps in Department of Energy Apps for Energy contest. Please Vote! We've entered WattBuddy and WattZ in the Department of Energy's Apps for Energy contest! You have to create an account, but it is pretty quick, and it would really help us to win this contest! We've been working hard, and we just added Texas electricity rates to wattbuy.com! It isn't often that you get to add a whole state to your product, especially a Texas-sized state. We have electricity rates for Sharyland, AEP North, New Mexico Power, AEP Central, Oncor, Nuces, and Center Point. Texas is one of the largest and most advanced deregulated energy markets, so we are really excited that we can provide electricity options to all our Texan friends. WattB won second place at the Department of Energy sponsored hackathon on January 25th at 1776. The winning entry, WattZ, was a working iOS application that used an address (or iOS GPS) to pull Zillow house information, then estimated electricity usage based on the Building Performance Database. We'll try to incorporate this new feature into an upcoming version of WattBuddy!